Got my copy of Guitarist today and Brian May is featured on the cover with an acoustic guitar of which he knew little except he'd got it in Japan circa 1974 and has liked playing since. 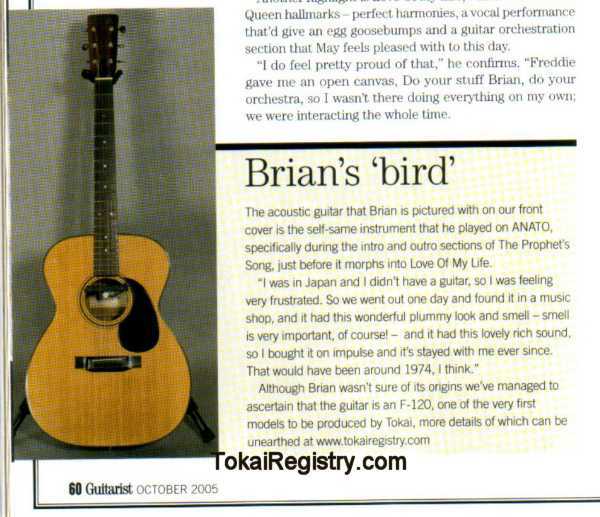 In the article it mentions the guitar is a Hummingbird (on the headstock) and the guys at guitarist found it was an F-120 made by Tokai. They then advise readers that more details can be 'unearthed' at tokairegistry.com. Expect a lot of traffic to the site Ned! Cool. Any chance of getting a scan of the article. The above looks similar to Brian's, but quality was much better in the old days, said Tokai people. By the way, the other day I watched the new Queen live video with Paul Rodgers from 2005 in Sheffield, and his guitar sound was as awesome as ever: a pile of Vox AC30s and massive reverb on it, loved it! I think it's time that Tokai comes up with a Brian May copy, you can even play "Alright now" with it! I was on my new year's vacation. Yes, I will be able to disclose interesting stories here sometime in March this year. I can't do it now ... Pls send me an e-mail to me for further information (kfd03611[ a t ]nifty.com). Sorry for my unwillingness to give info in a public space. Has somebody managed to get in contact with Daizo since then?